INTERVIEW. 'The Kindness of Strangers' is Lone Scherfig's first film set in the US, but in a number of ways it represents a homecoming for the acclaimed writer-director. The ensemble drama, which follows a group of disparate characters struggling to survive in a New York City winter, is opening the Berlinale and running in competition. There's something particularly special about the fact that 'The Kindness of Strangers' is opening this year's Berlinale. After all, the festival was the scene of Lone Scherfig's international breakthrough, back in 2001, when her Dogme film 'Italian for Beginners' won the Jury Prize and three more awards. And the director's films have screened in Berlin many times before and since. The new drama, which will also compete for the Golden Bear, feels significant for other reasons. It's the first time since 'Italian for Beginners' that Scherfig has directed her own, solo screenplay. And after four movies financed and set in the UK, it's the first time in several years that she's received backing from Scandinavian film bodies. As Scherfig puts it herself, "I'm home now. The film is a co-production with Canada, Germany and France, but with the Danish Film Institute, the Swedish Film Institute, the Nordic Film and TV Fund and the Copenhagen Film Fund, I have a different kind of family surrounding the film. And it's really good to have those parents. They have been immensely supportive and trusting." The film concerns a group of disparate characters in New York, each struggling to cope in the city – a mother fleeing her abusive husband with her children, an ex-con, an ER nurse buckling under the pressure of her job, a lonely young man, their fates intersecting in a once grand, now fading Russian restaurant. The international cast includes Zoe Kazan, Andrea Riseborough, Tahar Rahim, Caleb Landry Jones, Jay Baruchel, Esben Smed, David Dencik and Bill Nighy. While it might seem counter-intuitive for the Scandinavian industry to invest in yet another New York story, Scherfig believes they recognised the universality of her themes – including homelessness, domestic abuse, unemployment, criminal rehabilitation and, particularly, the value of compassion. It was always going to be set in New York. Some of it was written with specific areas, even street corners in mind. The city is an arena where you can juxtapose great luxury and poverty. So you can address these themes without putting it in the dialogue. "It was always going to be set in New York," she says. "Some of it was written with specific areas, even street corners in mind. The city is an arena where you can juxtapose great luxury and poverty, often in the same shot. So you can address these themes without putting it in the dialogue, it's just there in front of you. "But it's seen here through a European point of view, a European film tradition and film language. So hopefully this makes the film cross borders." The script was written before Donald Trump became president, but Scherfig observes that it's impossible to make a film about Americans today without it reflecting on the moral course being charted by the current administration. "When we come from Scandinavia we expect – for very good reason – that the State does the charity. But the safety net has very large holes in America. That's when people take over as individuals. You see Americans reaching out to help needy people in a way that I really admire and I think we could learn from – not politically, but as individuals." Scherfig agrees that there are similarities between the new film and the ensemble comedy 'Italian for Beginners'. "Most definitely. In the construction of the story, this mix of genres, of humour and an underlying darkness. Also I wrote both films," she smiles, "so the characters are related – and all live in my laptop. "But 'The Kindness of Strangers' speaks more about society. I'm older now, the world has become tougher, I'm having a more international look at things, and I feel obliged to tackle these serious issues. I've also become more fearless in terms of mixing humour with tragedy. I think that was enforced during 'An Education', because of Nick Hornby, whose script had that combination too." In fact, Scherfig has touched on one of the key elements of her more successful work. Just as 'An Education' tackled very sensitive issues about an older man's seduction of a teenage girl with a liberatingly light touch, so her earlier 'Wilbur Wants to Kill Himself' dealt with suicide in a way that was disarmingly comic; in each, the effect was to charm an audience while offering a refreshingly nuanced perspective on her subject matter. Scherfig insists on the value of "homework" when entering tricky terrain ("It's that Ken Loach thing: whenever you approach a cliché, just do more research") and a collaboration with her actors that keeps the material both "soulful" and true. A case in point is Bill Nighy, who reteams with Scherfig after his delicious turn as a thespian ham in 'Their Finest'. She couldn't have enough praise for the Brit, for whom she wrote the role of the Russian restaurateur Timofey. "Because he's also a stage actor, he has a very precise idea of the chemistry of a scene, whether an audience will warm to a moment. He protects you from making tasteless decisions. "To put Caleb Landry Jones, who's from Texas, a real cowboy and a proper Method actor, in a scene with Bill Nighy – who you never see in a suit that's not bespoke – is highly entertaining," she adds fondly. "Across the culture clash they can see how good the other is, and the scene gets a beautiful synergy. It's a joy to watch." The film was shot in Toronto and Copenhagen as well as New York. Most of the crew was Canadian. To put Caleb Landry Jones, who's from Texas, a real cowboy and a proper Method actor, in a scene with Bill Nighy is highly entertaining. Across the culture clash they can see how good the other is, and the scene gets a beautiful synergy. It's a joy to watch. 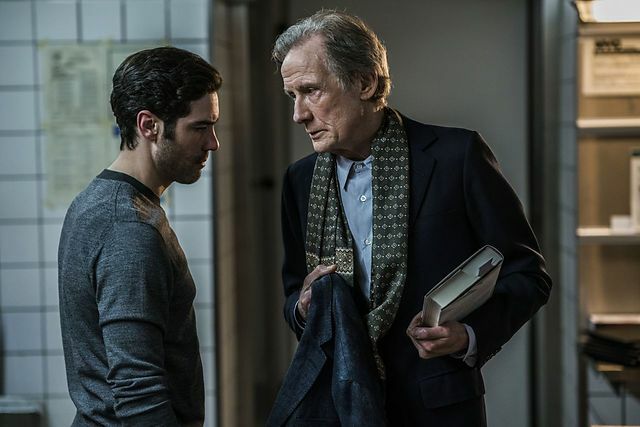 "After 20 minutes on set it's pretty much always the same," Scherfig says matter-of-factly. "It's like an orchestra, you feel very quickly that the machine is running and people do what they always do. I've never found that very complicated, nor to direct in languages that I'm not fluent in. A lot of directing actors is about shutting up and letting people find their way. I find it super inspirational." Her very first film, the comedy 'The Birthday Trip', was invited to Berlin's Panorama section, and her second, the children's film 'On Our Own', in what was then Kinderfilmfest (now Generation). It's surprising, then, when she claims that we might not be speaking about her career 20 years later were it not for the success of her Dogme film 'Italian for Beginners'. "Ole Christian Madsen, who I share a production company with, remembers that at the time I told him, 'If it doesn't work out this time, I think I'm going to find a different job'. I was just getting a bit disillusioned and feeling useless. I needed to find my feet and have people understand my tone. That's why I was willing to run a really big risk with Dogme, when they asked me to be their first sister." 'The Kindness of Strangers' is the opening film at the Berlinale and is also running in the International Competition. This marks the first time a Danish film opens the festival. Not only did the connection click, but she still finds the Dogme experience informs her work. "I trust that if there are obstacles – be it the weather or the script suddenly isn't working or technical matters – that I can come up with an ad hoc solution that can save the day. And I do it all the time. A big part of Dogme was that you had to let reality influence your story. That has given me a sense of security, the feeling that I won't give up and may even land on both feet, no matter what happens." 'Wilbur' and 'An Education' also played to Berlinale audiences. And now 'The Kindness of Strangers' will be the first Danish film to open the festival. "I think the fact that it's opening shows that it's entertaining. For that reason I'm proud: it's deep enough to be in competition and light enough to open the festival." 'The Kindness of Strangers' is directed and written by Lone Scherfig. The ensemble drama is produced by Malene Blenkov for Denmark’s Creative Alliance and Canada’s Strada Films with the participation of the Danish Film Institute and Telefilm Canada, DR, Ontario Creates, Copenhagen Film Fund, the Swedish Film Institute, Nordisk Film & TV Fond, Entertainment One and Ingenious Senior Film Fund/Apollo Media. It is made in co-production with Sweden’s Unlimited Stories, Germany’s Nadcon, France’s D’Artagnan, Film i Väst, Arte Grand Accord WDR/ARTE and ARTE France Cinema. HanWay Films is handling world sales and distribution rights backed by Ingenious Media and Apollo Media. An ensemble of disparate people, all in their own way struggling to survive in a New York City winter, find laughter, love and kindness in each other.